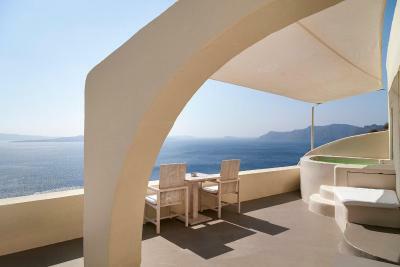 Lock in a great price for Mystique, a Luxury Collection Hotel, Santorini - rated 9.2 by recent guests. The staff and over all experience was exellent, truly a memorable trip. The view each morning stole our breathes. The hotel has a great situation with a nice view. 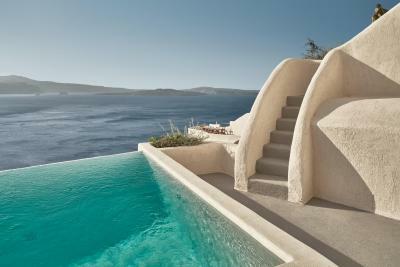 The infinity pool is gorgeous. We had the vibrant suite and it was great. Very clean and comfortable. The staff at the two restaurants is very good. We had dinner there and it was lovely. Everything was really perfect !! It was the second time we booked a room in this hotel. We already came two years ago for our engagement night/dinner with my wife and it was a delicious moment. We came last week with my wife and my parents into two beautiful suits and we have been upgraded in the luxury villa for the last night which was just incredible ! The personnel was lovely and helps my father (who is 78 years old) to go down and climb the stairs of the hotel. The view is simply wonderful ! 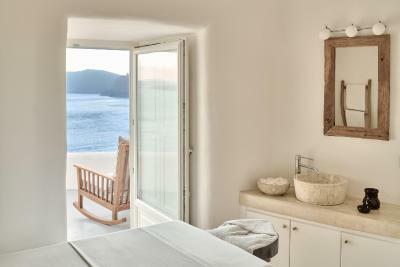 Each room offers privacy compare to the 5 stars hotels of OIA. I STRONGLY recommend this establishment ! One of the best and finest Hotels I've stayed in (other than asia). Location ans view are AMAZING! 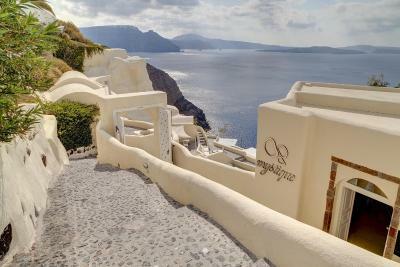 and it's 2 minutes walk from the old town of OIA. 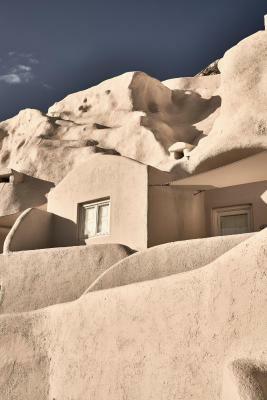 despite the short walk, when in the hotel, you can not feel or even hear others. 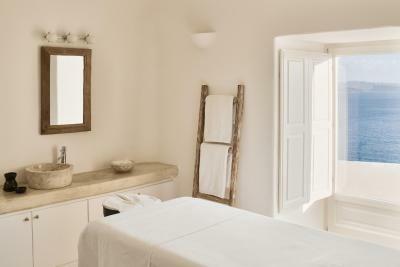 silence is what makes your stay here so comfortable and relaxing. Staff service was great. everyone are so welcoming and kind, and as you tan by the pool they always check on you, provide drinking water and treats. The pool bar manageress (hostess?) Alesandra was perfectly perfect. She seemed honestly delighted every tie she saw you and was really pro-active in trying to help. She must have been the best professional in the hotel, though none of the others were bad in any way. 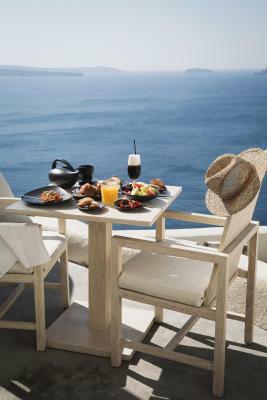 The breakfast was superb and very varied, from Greek yogurt to smoked salmon and champagne. The small delights of fruit and chocolate that kept appearing the the room was lovely. Staff super efficient and super friendly, room beautiful, expensive though. The view of our room no. 8 is fantastic and excellent. Every morning, the majestic view of blue see is in front of our eyes through the window. It made us felt exceptionally good. In addition, Nehir, one of the staff in the hotel was very friendly, she visited our room and greeting to us to make sure everything was OK. She always have a friendly smile and is very polite. All staff in the restaurant are so excellent and warm, in particular, Alex(short form only, I hoped I do not misspell her name). 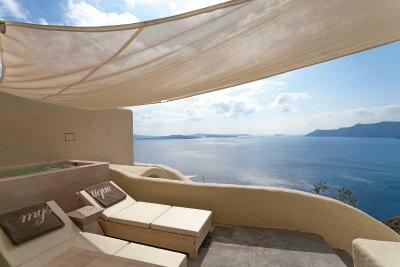 I will definitely recommend Mystique to my friends if they plan the vocation in Santorini. 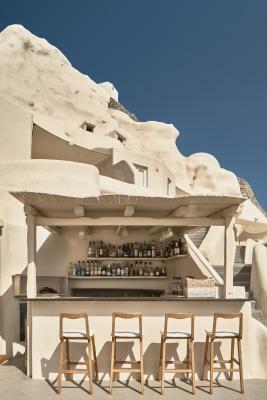 A localização é o melhor do hotel, perto dos resturantes e atrações de Oia. A vista é incrivel, mar e casinhas brancas, mas não dá para ver o por do Sol. O Serviço é maravilhoso, funcionarios educados e gentis. A decoração do hotel é elegante. A cama do quarto é super confortavel. Apesar do check out ser meio dia, nos deixaram usar as dependencias do spa para tomar banho antes de ir para o Aeroporto mais tarde. Café da manhã muito bom. Atendimento e cordialidade excelente. 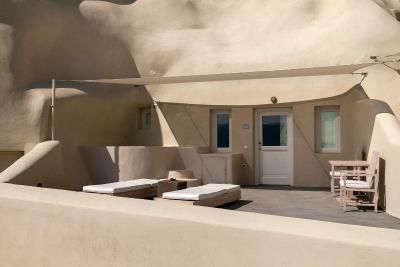 The Allure Suite was awesome, with upscale natural furnishings, private balcony and incredible view of caldera! Indoor jacuzzi was perfect. 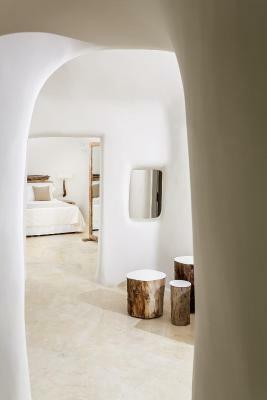 The bedroom was like being enveloped in a white cave-with amazing linens and super comfortable bed and pillows. Staff were all friendly and helpful. Concierge had great suggestions before arriving and during our visit. 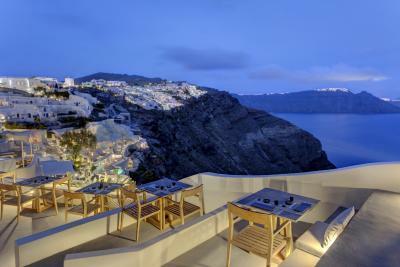 Mystique, a Luxury Collection Hotel, Santorini has been welcoming Booking.com guests since 10 Jul 2009. 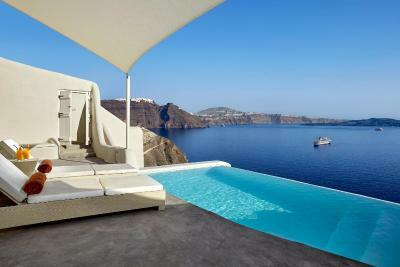 When would you like to stay at Mystique, a Luxury Collection Hotel, Santorini? 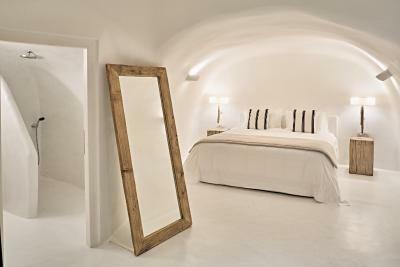 Located on the upper level of the hotel, the Vibrant Suite is cave-style, in the traditional Santorini architecture. 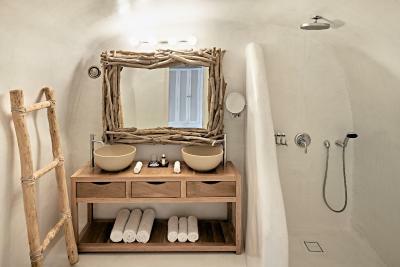 Includes a spacious bedroom with king size bed and open-plan living space, private balcony with open-air dining area and sun beds, great views to the sea and the Caldera, bathroom featuring hydro massage bathtub with shower. 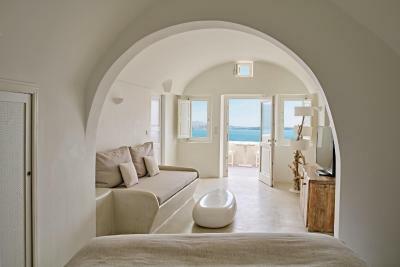 Features a spacious bedroom with king-size bed and living room, large panoramic private terrace with open-air dining area and sun loungers, views of the sea and the Caldera, bathroom featuring spa bath and glass cabin shower. 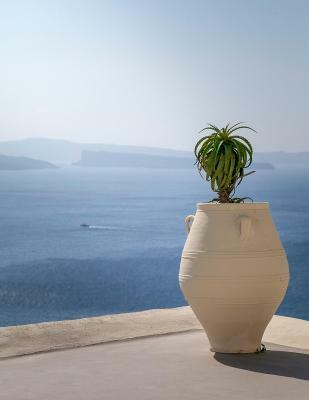 Featuring an outdoor hot tub and views to the Caldera and the Aegean Sea from its terrace, this elegantly decorated, air-conditioned suite comes with an open-plan living room. 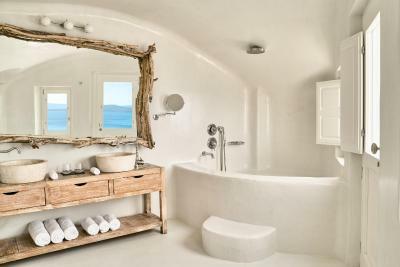 Fitted with a spa bath, it offers a minibar and a flat-screen TV with satellite, cable and pay-per-view channels. Free Wi-Fi is available. This exclusive suite features a spacious bedroom with king-size bed, a living room, a private fitness room and a large private terrace with outdoor hot tub, open-air dining area and sun loungers. It offers views to the sea and the Caldera, and also includes a bathroom with hot tub and glass cabin shower with steam bath combination. Two spacious bedrooms with "The Luxury Collection" beds and ample, open-plan living space, a panoramic private terrace featuring open-air dining area and outdoor hot tub, and an airy bathroom with glass cabin shower. 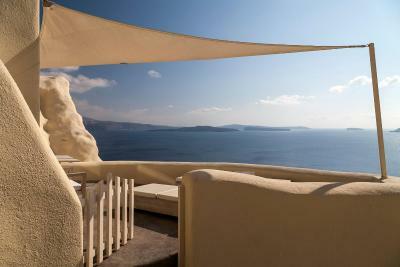 Overlooking the Santorini Caldera, the volcano and the Aegean sea, the Villa provides a fully private terrace. Includes spacious bedroom with king-size bed, large living room, indoor dining area, private fitness room, bathroom featuring hot tub and glass cabin shower with steam bath combination. 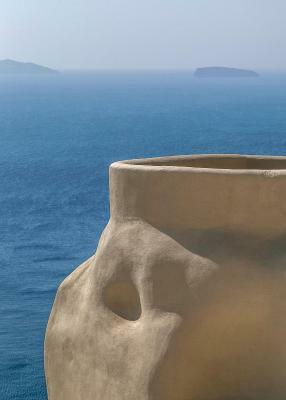 An open air hot tub and a private plunge pool with views to the sea is provided. Free standing villa with a large living space, indoor dining room, spacious bedroom with "The Luxury Collection" king-size bed, airy bathroom featuring steam bath combination, private fitness room including treadmill, bicycle, power plate, weights and massage bed. Large panoramic private terrace with infinity-edge pool, open-air dining area and sun-beds. 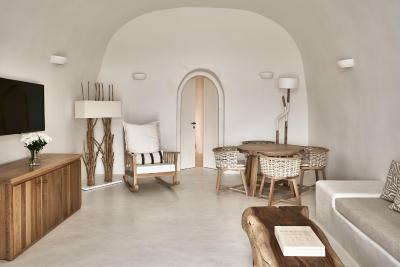 The Holistic Villa is a free standing villa located at the highest point of Mystique. 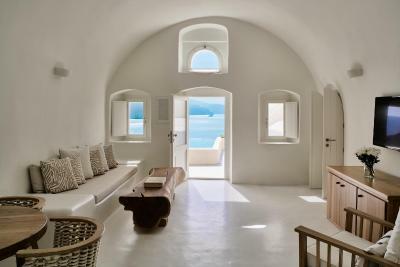 Designed to be Mystique’s most spacious room, the villa features a large living area and 2 spacious bedrooms with "The Luxury Collection" beds, both with en-suite bathrooms. 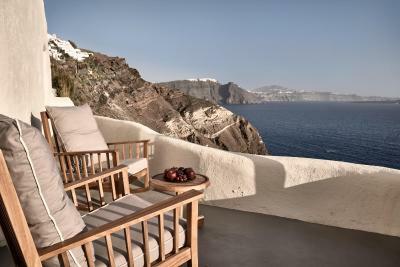 Its private terrace has panoramic views to the Aegean Sea and Santorini's majestic volcano, while it comes complete with an infinity pool and an outdoor hot tub surrounded by sun beds and an open-air dining area. 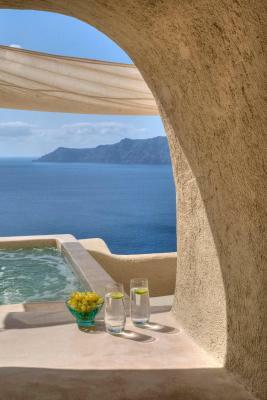 House rules Mystique, a Luxury Collection Hotel, Santorini takes special requests - add in the next step! 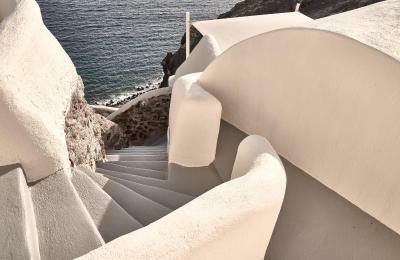 Mystique, a Luxury Collection Hotel, Santorini accepts these cards and reserves the right to temporarily hold an amount prior to arrival. Location is at the bottom of a cliff, prepare for some hiking up each day. I paid almost $3K per night for a room with a private swimming pool. It was supposed to be an infinity pool however there was a tree that was blocking our panoramic view of the ocean. I felt misled by this. Everything was brilliant for the most part. Treacherous pathways, not for anyone with mobility limitations! We stayed here for our honeymoon and had an amazing time. The food, the view, the service...everything was just perfect! We definitely recommend this place to everyone! Thank you Mystique hotel for such a memorable experience. The steps are many! I wish we had been more aware of the steps. The people we were traveling with had walking issues and it limited their ability to leave the property more that once a day. There is no access to the beach from the hotel. The parking was additional and required a walk but it was relatively close. The staff was excellent! They went out of there way to see to your needs. They knew our names from the minute we arrived. The view is magnificent from every room and all the restaurants. Our room had a private hot tub which was fantastic and we used daily. We rented a car a were able to tour the island and different beaches. The boardwalk is in walking distance with the shops and many restaurant which offered options. It was a fantastic vacation. Breakfast You have to pass right through people's rooms and where they sunbathing or in Jacuzzi to get to your room, feel like you're intruding, tv stations-only one showing movies wasn't working, but not there to watch tv so it's fine. Expensive airport transfer. Staff, cute rooms, view, location. There is not one thing I can think that would have made our experience better. The room was beautiful and provided everything you would expect in a luxury hotel. The staff always made sure you had water and a snack in your room. Excellent service all around! It does not have a full sunset view as sun dips in the water. It's. It far from a big deal but it's one issue. Pool was a little small too and the rooms are very pricey. It's not different than most of oia for pricing but it's indigent. 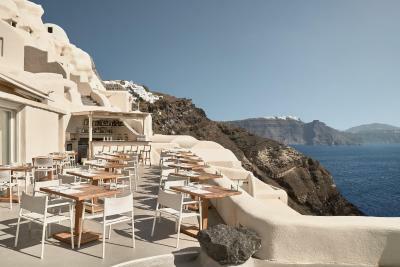 Chic zen like quiet romantic place with great service and great views right in oia. Food was terrific and the overall experience was very special. 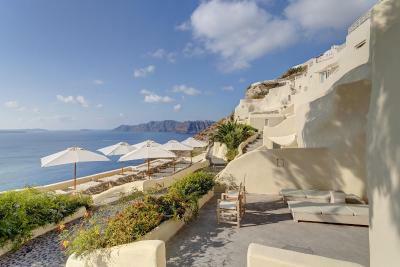 My husband and I stayed only for one night because it was our first time in Santorini and we wanted to try many hotels because we will definitely visit again that paradise. The staff at the reception wasn't really helpful and friendly. When we arrived they were stressed and not very welcoming. The quality of the food for breakfast could be much better. For a luxury collection hotel we expected better. Many details ignored!! !